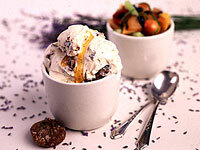 The intriguing flavor of lavender perfumes this rich and creamy ice cream. Studded with figs and drizzled with lavender honey, it makes for a sophisticated dessert. 1. In a large saucepan, scald cream, milk and vanilla bean. Remove from heat, cover, and infuse flavor for 30 minutes. 2. In a large bowl, beat yolks with sugar and honey until sugar has dissolved. Set aside. 3. Reheat cream to scalding. Pour a small amount of hot cream into yolks, whisking. Return to saucepan; whisk in remaining cream. Cook until mixture thickens. Add figs; chill. Freeze in ice cream machine. 4. Serve ice cream with a drizzle of lavender honey if desired, alongside seasonal fruit salad perfumed with a drop or two of lavender oil.